Team Glazer talks to Joe about Dirk Koetter at the NFL Owners Meetings. It’s that glorious time of the year, when Joe sits down with Team Glazer for a 1-on-1, owner-to-Joe chat about all things Buccaneers. At a private, umbrella-covered spot at the swanky Arizona Biltmore resort in Phoenix, Joe peppered Bucs co-chairman Joel Glazer with a variety of questions at the NFL Owners Meetings this evening. Here’s the first episode of the chat: The focus was on winning Bucs coach Dirk Koetter. JoeBucsFan.com: You’ve been around seven head coaches in your time with the Bucs. With that experience, what really sets Dirk Koetter apart? Bucs owner Joel Glazer: One thing that really sets him apart is his long experience as a coordinator in the National Football League. I think he brought that level of experience to our team, where he had seen a lot of different situations. He’d been in a certain position for a while. So he was able to have an edge being a coordinator for a while, just to kind of from one spot see what was going on. Two, his directness. When he’s speaking to players or he’s speaking to anybody, he says what he’s thinking. There’s no masking the words. There’s no trying to figure out the code. And I think people find that refreshing. I think in anything, if you’re dealing with somebody, say it like it is, and you know where you stand with Dirk. And he’s been a great leader. I think his leadership traits don’t get enough credit, the way he leads the team and motivates players. Joe: Koetter is known for his candor. Jason Licht even said last year that he had been “Koettered” at times when Dirk doesn’t agree with him. Do you feel Dirk has been candid completely with you, and have you ever been Koettered? Team Glazer: Yeah, I always think he’s candid. And I appreciate that. Again, you know what a person’s thinking. When you get candor, at least whether you agree or disagree, you can have a conversation about it. It’s when people aren’t candid with each other, that leads to problems, that leads to miscommunication, that leads to frustration. But he’s been a pleasure to work with and he’s been been everything we’ve hoped for and more. 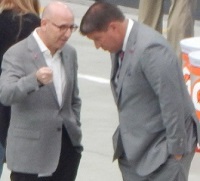 **Editor’s note, Joe did not ask Team Glazer whether he thinks Koetter “speaks softly.” Come back to JoeBucsFan.com through this week and next for more from Team Glazer. Thanks for the good stuff Joe. I wonder how many times did Team Glazer say to themselves in 2014 and 2015 “WTF is our head coach talking about”!!!! “What is that buffon up too”???? Thx for the info Joe!!!! I hope you got a moment off the record with Team Glazer, so they could finally set you straight on the whole dominik fiasco!!!!!! I hope they keep their opinions to themselves. We dont need them trying to “fix” the team. Joe, did you ask them about changing the uniforms in 2 years? Agreed Hammock! i own a few but wish they would change them. I even got Winstons Colour Rush and one of my Evans Jerseys is Salute to service because i don’t like our jerseys all that much compared to the retros. Change them up. Get rid of the clock numbers and weird trim. Make it old school again. Yeah Bonzai. I hope Licht and Koetter can keep building this team up. Then the Glazers can push thier portfolios and not have to make football decisions. They havent made many good hires over the years. BTW….Lovie Smith is the guy who hired Licht, thank god the Glazers didnt have to call the shots on that one. Kinda afraid to make any comment in hopes I won’t banned or monitored. We don’t thank lovie for mentioning Lichts name as one of the GM’s he wanted!!! We thank Licht for being desperate enough to be a GM that he would try to work with with coach my scheme!!!!!!!! Lol……..do ya think Lovies scheme is still being studied by coordinators around the NFL? Lovie coached a team to the Super Bowl. What have any of you ever done? Dude dont talk about Tandyman like that!!! Im well aware those 4 games could be just a flash but he showed great instincts and no reason to just write him off til he lays an egg. Thats exactly why he’s our Coach and will hopefully continue to be for years. GMC is one the best DT’s in the NFL!! Interesting stuff here. What I came away with is, these guys have matured over the years as far as a franchise goes. Since the malcolm and Chucky years we’ve experienced some real bad times and now it seems the boys have kind of figured out what’s wrong. They made a huge improvement by hiring experience to the vital positions. I aplaud them and am absolutely on board. Tmax, if you were really tgis elitist, you would have jumped ship long ago. Yes Joe. Please ask the Glazers when they are changing the horrible clown suits they forced onto our players without ever asking for any feedback from fans or anyone I know of outside of Nike. The new helmets are cool – but the Bucs current uniforms are an abomination and need to be re-designed ASAP. These owners have got to be losing a lot of revenue on jersey sales because the uniforms are so hideous looking. I personally will NEVER buy any more Buccaneer gear until the Glazers change the uniform design to something better than what we now have. And I know I am far from alone in this thinking. It would be awesome to have a Winston jersey – and a Kwon and an Evans too. But I refuse to pay any $ much less the exorbitant prices charged for NFL jerseys for what is literally the WORST uniform in the entire league. Ask the question please Joe. When – oh WHEN can we get rid of these terrible, alarm clock inspired, Burger King resembling Buccaneer uniforms? speaking of jerseys, and yes the current ones are horrid! I wish for 58 he could just put KWON across the back. That would be cool. Those look horrible on females..I tried one on and looked like a giant square shaped car radio.. I decided to wear my older stuff.. Finally the G-boys realize that a good coordinator can become a really good coach, oh yeah, they did that with HOF’r Tony Dungy. Had a plan, straight shooter, maybe not in the same way Dirk is and has the ability to get the team to respond and do your job. Come on dougie balls, you should know tmaxipad lives in his own single wide trailer. That’s why he’s so negative all the time. I wear my Winston jersey regularly during the season doesn’t mean I like it. It’s almost as if Lovie even had a hand in those too. Horrible decision. Never thought I’d say this, but the creamsicles are even better.